Pat Bravo invites you to travel the world with her Indie video. Who doesn't love the miracle of Aviation? I love to travel and I especially love to fly, so I came up with this little project, influenced by an awesome vintage print I saw on Pinterest. You can use this block alone to create a super sweet aviation art quilt, or make a few more and make a quilt filled with Airplanes! A printer and paper, Scissors, Rotary Cutter, Cutting Mat, Coordinating Thread. Finished Size: 24 1/2" x 14 1/2"
**Note seam allowances are 1/4". Print templates at 100%. Print two copies of the Nose templates and cut out your fabric using the templates. 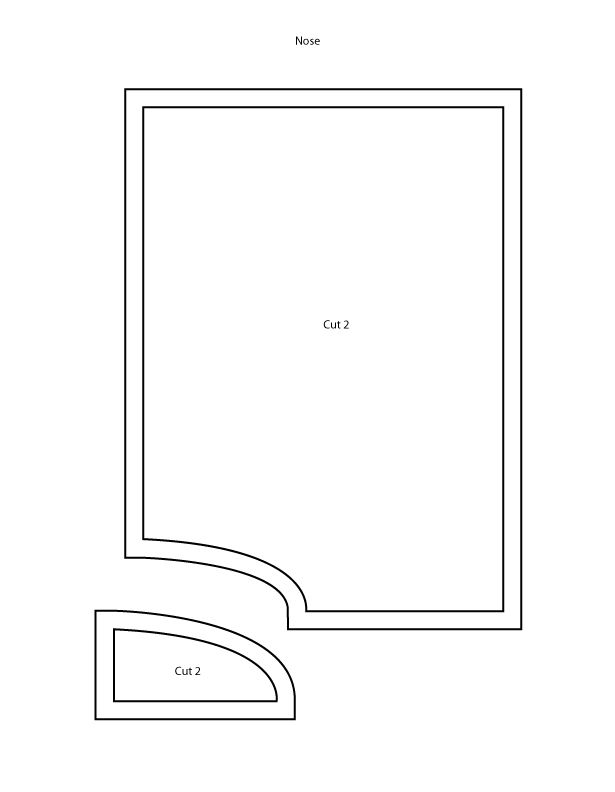 Print two copies of the Tail and Wing templates. One copy you will use this as the paper foundation for the paper piecing. Cut out the templates which include seam allowance. Cut the other set into pieces and use them as patterns for cutting your fabric. You only need to cut out one section (top OR bottom). Fold your fabric in half and pin these patterns to the wrong side of your fabric and cut around them. 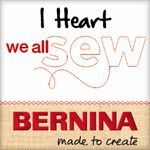 Be sure to add a generous 1/4” seam allowance around them using a rotary cutter and a straight edge. 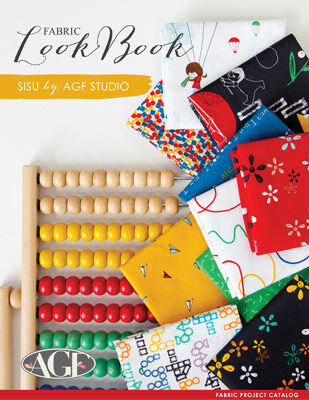 You'll have two sets of fabric pieces for the top and bottom. Set aside. Starting with the Tail Bottom template, gather your fabric pieces. 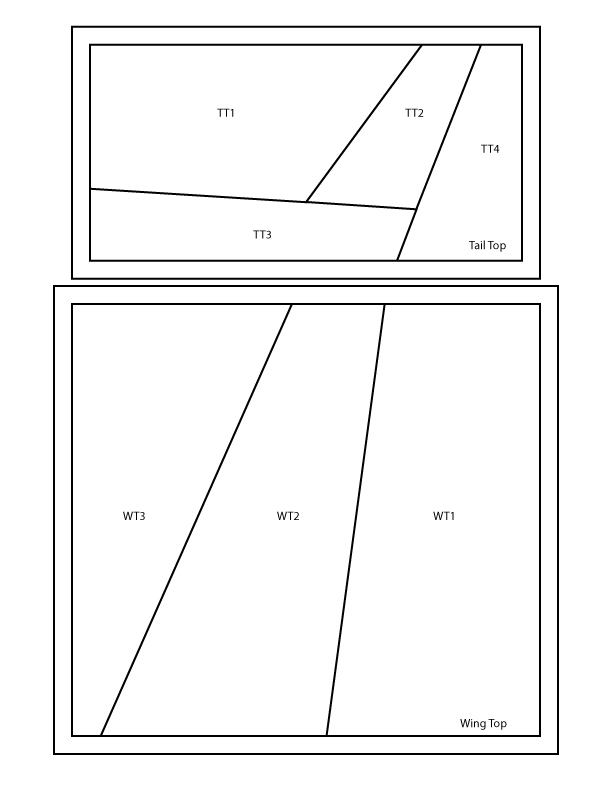 (TB1, TB2, TB3 &TB4) You want to use the pieces that are mirror images of the template. Take the template and place it in front of you blank side up. Place fabric piece TB1 on top of the template in it's corresponding position right side up, lining up the edges and pin in place. You can hold them up to a light to make sure that the lines are positioned properly. Place fabric piece TB2 on top of TB1 right side down. Line it up as shown in the image above and pin in place. Open up the seam and finger press. Using the same process as before place TB3 on top of TB1 & TB2 and pin. 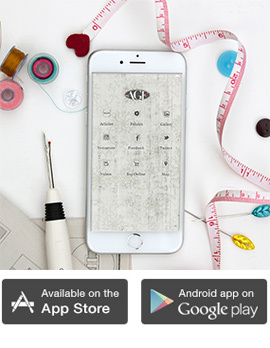 Turn the template over as in the previous steps and stitch through the paper between section TB1/TB2 & TB3 starting and ending with a backstitch. One more time! Place piece TB4 on top of TB2/TB3 and pin. Turn the template over to the side with the text and stitch between section TB2/TB3 & TB4 starting and ending with a backstitch. Repeat these steps with the remaining tail pieces and the Tail Top Templates to make the second panel. Now that you have your two panels, place them right sides together and stitch down the longer edge forming the tail of the airplane. Next stitch your 6 1/2" x 4 1/2" panels to either end. Carefully remove the paper and press the seams open. The tail is complete! Set it aside. 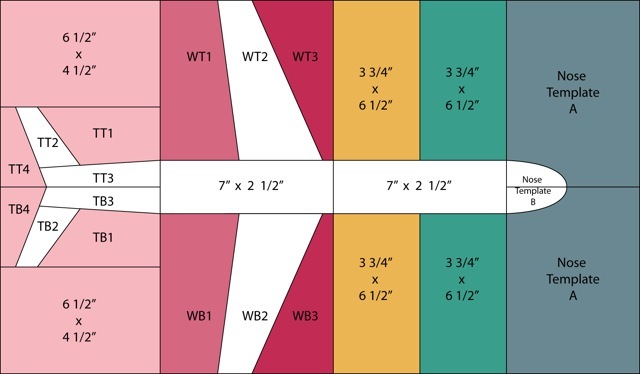 Starting with the Wing Bottom template, gather your fabric pieces. 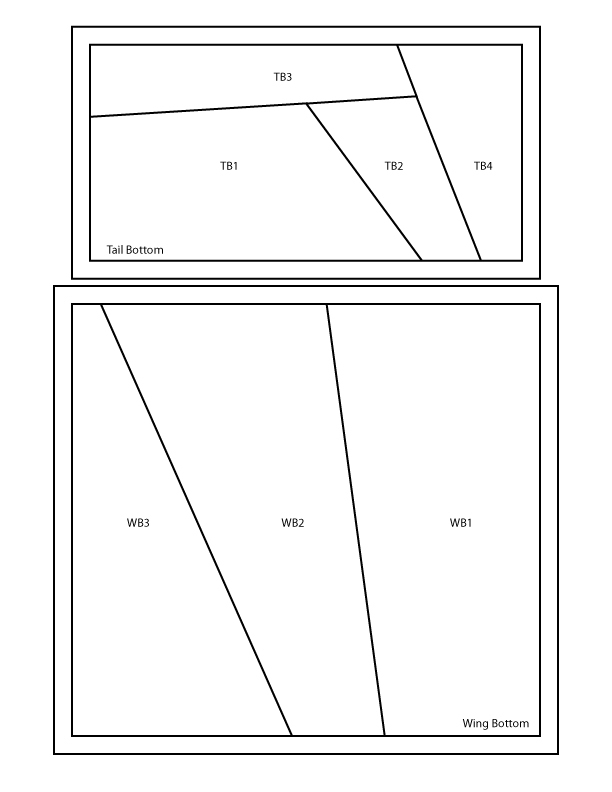 (WB1, WB2, & WB3) You want to use the pieces that are mirror images of the template. Take the template and place it in front of you blank side up. Place fabric piece WB1 on top of the template in it's corresponding position right side up, lining up the edges and pin in place. Place fabric piece WB2 on top of WB1 right side down. Line it up as shown in the image above and pin in place. Open up the seam and finger press. Repeat the process as before with piece WB3 to complete the Wing Panels Bottom and Top. Now that you have your two panels take one of your 7" x 2 1/2" pieces and stitch it between the two Wing Panels. Remove the paper and press the seams open. You Wings are complete! Set them aside. Lay the 3 3/4" x 6 1/2" pieces and the remaining 7" x 2 1/2" piece in front of you using the image as a guide. Stitch two of the 3 3/4" x 6 1/2" pieces together to form one 7" x 6 1/2" piece and press the seams open. Repeat with the remaining 3 3/4" x 6 1/2" pieces. Finally, stitch the 7" x 2 1/2" between the two panels you just made. Press the seams open. You've completed the Airplane Body! Set it aside. Gather the remaining fabric, you should have 2 large background pieces and 2 small Nose pieces. Taking one of the small Nose pieces and starting at the tip of the Nose, pin it to one of the background pieces. Go slowly and use lots of pins! Press the seams toward the Nose. Repeat this with the remaining two fabric pieces. Now that you have two panels, stitch them together and press the seams open. You've made the nose! Woot! All that's left to do is stitch all of your rows together! Line up the seams on your Airplane. Don't worry about the outer edges of your panels, you can square the whole thing up once you finished. Leave a comment on Rashida's 'I Heart Linen' blog and let her know "Where would you travel to if you could hop on a plance right now? 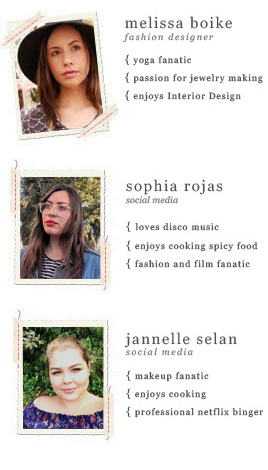 and Subscribe to our blog to stay up to date on all thing AGF & the Fat Quarter Gang! Enter to win today! Giveaway open until Friday, Aug, 10th.